Oasis of the Seas Central Park and balcony staterooms. Find your Oasis of the Seas stateroom. Those of us on Florida’s Space Coast are thrilled to have Royal Caribbean’s Oasis of the Seas right here in our backyard. Those who live only a day’s drive from Port Canaveral are secondly thrilled. Finally, if you choose to fly into Orlando or Melbourne, good for you. You’ll find cruising in and out of Port Canaveral to be a pretty much stressless experience. Built in 2009 and refurbished in 2014, the 5,400 passenger Oasis of the Seas has no less than 41 categories of staterooms. 41! Among these 41 categories of staterooms and just over 2700 staterooms, 45 are wheelchair accessible. There are no single/solo passenger staterooms. So you’re ready for a cruise aboard the Oasis of the Seas. Here’s the breakdown of all these categories. When it comes to choosing your inside stateroom, you have seven choices from which to choose. Q – Least expensive interior stateroom: 140 – 150 sq, ft.
K, L, M, N – Large interior stateroom: 172 sq. ft.
M – Promenade stateroom (overlooks Promenade; guests across the way can see in, as can people strolling the Promenade): 193 sq. ft.
FI – Family Interior stateroom – accommodates up to six guests: 274 sq. ft.
F, G, H, I – Standard oceanview stateroom: 174 sq. ft.
BV – Boardwalk view stateroom: 187 sq. ft.
CV – Central Park View stateroom: Slightly larger at 194 sq, ft., usually costs slightly less than the BV. FO – Family Oceanview stateroom: at 272 sq. ft., this will accommodate up to six people. 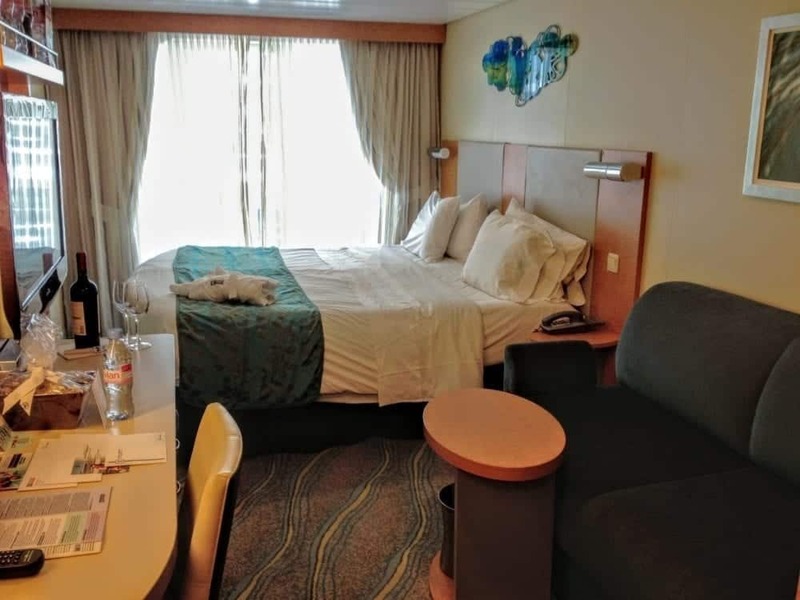 D1 through D8 – Superior Oceanview staterooms with balcony: 182 sq. ft with a 53 sq. ft. balcony. Hint: D5 staterooms 12238, 12240, 12242, 12244, 12246 and 12248 have a larger 82 sq. ft. balcony. C1, C2 – Central Park view stateroom with balcony: 182 sq. ft. with 50 sq. ft. balcony. B1, B2 – Boardwalk view stateroom with balcony: 182 sq. ft. with a 40 sq. ft. balcony. Hint: The most prized BV staterooms are as far aft as you can get. You can watch the Aqua Theater right from your balcony. These staterooms book up months in advance. FB – Family stateroom with balcony: 291 sq. ft. and 81 sq. ft. balcony. Like the other family stateroom categories, this one also will sleep up to six guests.